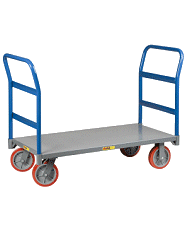 Long regarded as the number one furniture dolly, these all steel frame furniture dollies last many times longer than the cheap wood dollies. The carpeted deck surface helps retain the load and offers scratch-free transportation. Made in the USA!